SALT LAKE CITY, Utah — Grand Canyon Trust today sued Energy Fuels Resources in Utah federal district court over ongoing radon pollution problems at its White Mesa uranium mill near Blanding and White Mesa, Utah. The suit aims to correct ongoing problems at the mill and to ensure resources are available for cleanup and reclamation. 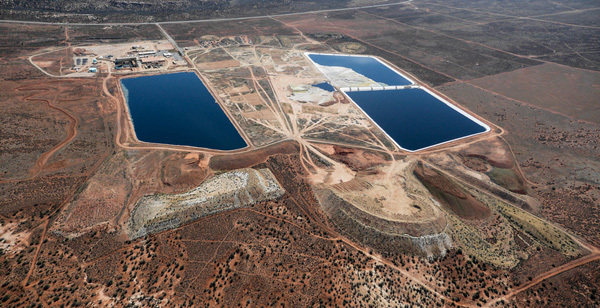 White Mesa is the only conventional uranium mill operating today in the U.S. It processes ore from regional uranium mines, including near Grand Canyon. It also receives, processes, and disposes of radioactive waste, or “alternate feed,” from Superfund sites and other locations across the U.S. that are contaminated with radioactive waste. The suit cites data showing that in 2012 and 2013, radon-222 emissions at the mill exceeded hazardous air pollutant standards. Exposure to radon-222 is linked to cancer, genetic defects, and increases in mortality rates. It further alleges that, during that same period, mill owners exceeded the legal limit for the number of on-site pits that are filled with uranium wastes known as tailings. Regulations limit the number of tailings impoundments to ensure ongoing remediation and to avoid mill closures causing abandoned impoundments and pollution. For example, the ongoing cost of the federal closure and remediation of the abandoned Atlas uranium mill outside Moab, Utah, is expected to exceed $1 billion — a cost borne by taxpayers. Citing poor market conditions, Energy Fuels in December announced that it plans to close the mill in 2014 and potentially reopen it 2015. It also announced that it would shutter its Pinenut Mine, located just north of Grand Canyon and, pursuant to a legal agreement with Grand Canyon Trust, the Havasupai Tribe and others, cease efforts to open its controversial Canyon Mine. Attorneys Travis Stills of Energy and Conservation Law and Anne Mariah Tapp and Neil Levine of Grand Canyon Trust represent the Grand Canyon Trust. Aerial view of the White Mesa uranium mill.